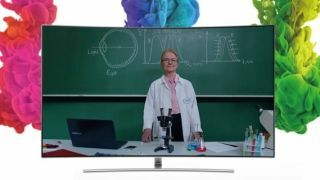 Samsung is making it easier for people with colorblindness – scientifically known as color vision deficiency (CVD) – to see colors while watching QLED TVs like the Samsung Q9F. Today the Korean tech giant announced the wide launch of the SeeColors app, which does exactly what it says it does by letting users test their personal visual spectrum and automatically adjust their QLED displays for a more accurate and vibrant viewing experience. Samsung claims that the majority of the 300 million people worldwide affected by CVD are unaware of their condition. Apparently the app works so well that you might discover you suffer from CVD even if you weren't aware of it before. To make SeeColors, Samsung worked with the Budapest University of Technology and Economics' Klara Wenzel, who developed the "Colorlite Test" that lets people diagnose the extent of their CVD with the use of color filters and "mathematical models." The app was already available in 2016 Samsung SUHD TVs, but as of today you can reportedly download it to any QLED TV through the Smart TV app store as well as to the most recent Samsung Galaxy smartphones, including the Galaxy S8 and Galaxy S8 Plus, through Google Play or the Galaxy app store. Once you take the test on your Galaxy smartphone, just hook it up to your QLED TV and the settings will reportedly automatically adjust. It's such a simple app, but it could profoundly affect the way you see the world. If you're interested in what sets QLED TVs apart from OLED and LED and all that, be sure to read this primer we recently posted.